When you donate to Metro Catholic Outreach, you are helping people in the Cedar Rapids metro area who are in need. You can help MCO in three meaningful ways. You can give food items to our pantry, contribute non-food supplies, or provide a financial gift. Non-perishable food items – Each time you shop for your own groceries, consider purchasing items to donate to our food pantry. Reference the list of food items we consistently need in our pantry to provide weekly food baskets. 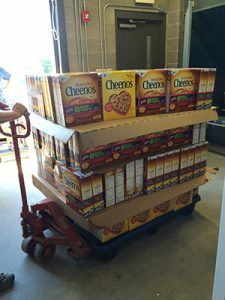 You also can check our MCO Facebook page for the food pantry urgent needs list. We cannot accept food past its expiration date. Fresh produce – We accept produce donations during regular office hours. Label the produce container before donating. Monday and Tuesday are the best days to make produce donations, so it can go out to our families’ in need in the food baskets on Wednesday and Thursday. 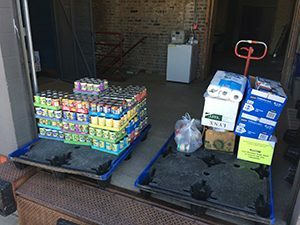 Cash donations to purchase food – If you give a cash donation, MCO is able to maximize the value of your donation by making bulk purchases from the regional food bank. For example, we can buy three times the macaroni and cheese for the price the grocery store sells it for, or Cheerios for 57 cent a box. Make a monetary donation to support our food and financial programs. You can donate in person, by mail to our office, or online.